Whether used to enhance the identity of an entire community or an individual institution, street furnishings present a primary opportunity to engage the public with design. From planters and bike racks to seating and waste bins, all elements play a part in the dialogue. 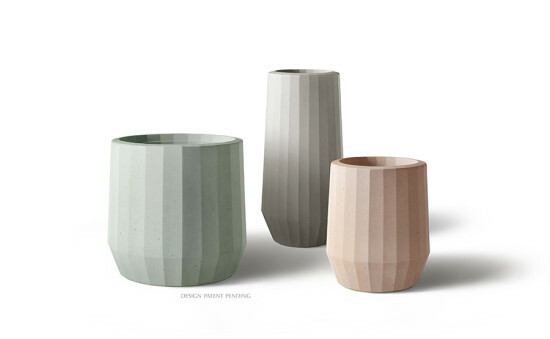 Cirque Collection Kornegay Design These cast concrete landscape containers take their design cues from nature: Composed of 24 facets placed at 15º intervals, the tapered-cylindrical form interprets the rotation of the earth. Designed by Larry Kornegay. Twist Bike Rack Forms + Surfaces Tweaking a double helix form, this bike rack offers two-point support and multiple locking options. Made of solid cast aluminum, it is available in 20 powder-coat finishes. Big Blok with Lights Tectura Designs Combining seating with lighting, this massive cast-concrete form measures 52x52x18 inches. A coordinating bench-style model is also available. Designed by Damon Farber Associates. Basket Planters Fermob A steel frame/handle makes these aluminum planters portable. The Long model measures 47 x 10 x 29 inches; the High model measures 28 x 13 x 33 inches. Available with anti-UV powder-coating in 24 colors. Designed by Fabio Meliota. Pitch Waste Bin Landscape Forms Pitch is a litter receptacle with flair. The heavy, stable cast-iron base coordinates with the perforated aluminum sides of the container. Available in freestanding and surface mount models, in top- and side-opening styles. Designed by frog. Siardo 700R Benkert Bänke The open structure of this bench ensures that water and debris don't collect on the surface of the seating area. The stainless steel piece can be finished in several powder-coat colors. Designed by Gerhard Benkert. From quasi-camouflaged to head-turningly flamboyant, these designs for outdoor seating can enhance the character of a commercial plaza, a municipal complex, or an outdoor hospitality area. 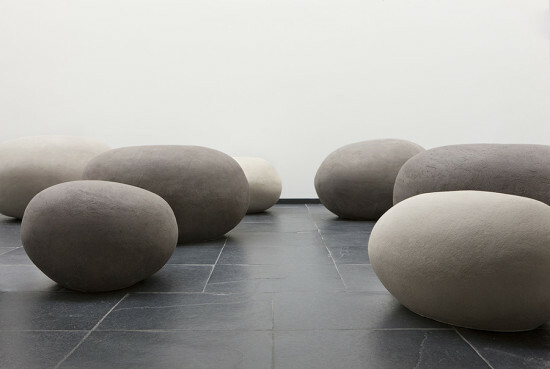 K Series Atelier Vierkant Set in a hardscape or landscape, these ceramic boulders provide visual interest—subtle or striking, depending on the context—as well as seating. Custom engraving is offered. Available in rounded and elongated profiles and several colorways. Comfony 600 Benkert Bänke A sinuous, contoured stainless steel frame is fitted with aluminum slats to create a minimalist lounger. Components are offered in a limited palette of colors and finishes. Palissade Collection Hay The slatted designed of this bench prevents water and debris from collecting on the seat. Part of a 13-piece collection of tables and seating, the powder-coated steel pieces are offered in three colors. Designed by Ronan and Erwan Bouroullec. Stay Bench Landscape Forms Part of the 35 Collection, this curvaceous cantilevered bench comes in backless and backed models; skateboard-discouraging seat dividers are optional. Surface- or embedded- installations are offered. In 22 standard colors; custom finishes available. Designed by frog. Folly Magis Fabricated in rotational-molded polyethylene, this loopy geometric bench has a matte finish. Designed by Ron Arad. Orange Beast SIXINCH This exuberant lounge is made of recyclable, CNC-cut foam. It's coated with a substance that's flexible as well as weather-, water-, and UV-resistant. Measuring more than 13 feet long, it can seat a crowd in comfort. Designed by Pieter Jamart. The “payphone"—like subway tokens—is a word that has increasingly become synonymous with an older New York. It’s been years since many of us have even stepped into, let alone used, one of those bulky, eerily abandoned and, let's face it, uninviting, telephone booths peppering New York City’s sidewalks. But unlike subway tokens, the payphone is making a comeback. In 1999, The City Department of Information Technology and Telecommunications signed a contract regarding the maintenance of New York public payphones, but since the contract expires on October 15, 2014, Mayor Bloomberg established the Reinvent Payphones Design Challenge, inviting urban planners, designers, students, and technologists to come up with a new design for the city's 11,000 payphones that will reflect Manhattan's changing aesthetics and provide an answer to the increasingly demanding digital needs of the modern-day New Yorker. Over 125 submissions, and 11 finalists later, the judges finally selected 6 winners at last night’s Payphones Demo Day which took place at social-product-development company Quirky. Winners were named for each of five categories: Creativity, Connectivity, Visual Design, Community Impact, and Functionality. A popular Choice award, to be announced on March 15, will be decided by a public vote. FX FOWLE’s NYC Loop took home the prize for Creativity. The design preserves the signature “booth” feature of the traditional payphone but adds several modern twists. 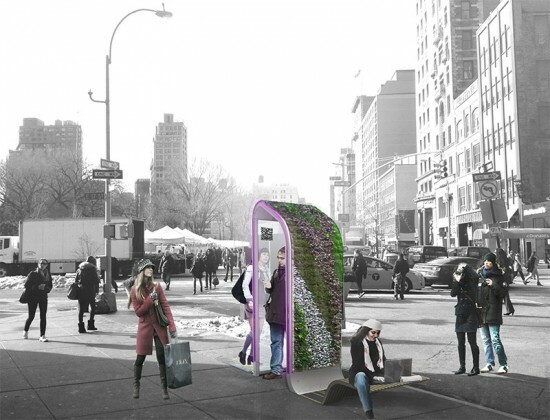 Equipped with a WiFi hub, smart screen, and sound harmonizing technology, The Loop allows users to momentarily step out of Manhattan’s mayhem and into a semi-private space to make a call. The design also features an "information puddle" that spills on to the sidewalk, creating opportunities to advertise local events and allowing passersby to access information such as maps and transit services. Sage and Coombe Architects' design for the NYfi was awarded the prize for Connectivity. 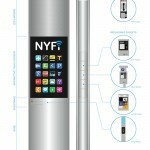 The NYfi is a sleekly designed interactive portal with a digital touch-screen display featuring applications that will allow pedestrians to access public information, transportation services, emergency assistance, and a free Wi-Fi connection. A flexible infrastructure permits the future addition of applications, allowing the portal to adapt to the growing and continuously changing needs of New York City. The Visual Design award went to frog design's Beacon proposal, which bills itself as "New York City’s next generation open communications platform." Acting as a communication hub, Beacon is powered by solar cells and includes LED information screens and speakers and can be controlled by voice and gestures using an array of sensors and directional microphones. When awarding the Community Impact award the judges found two submissions to be equally worthy, resulting in a tie. 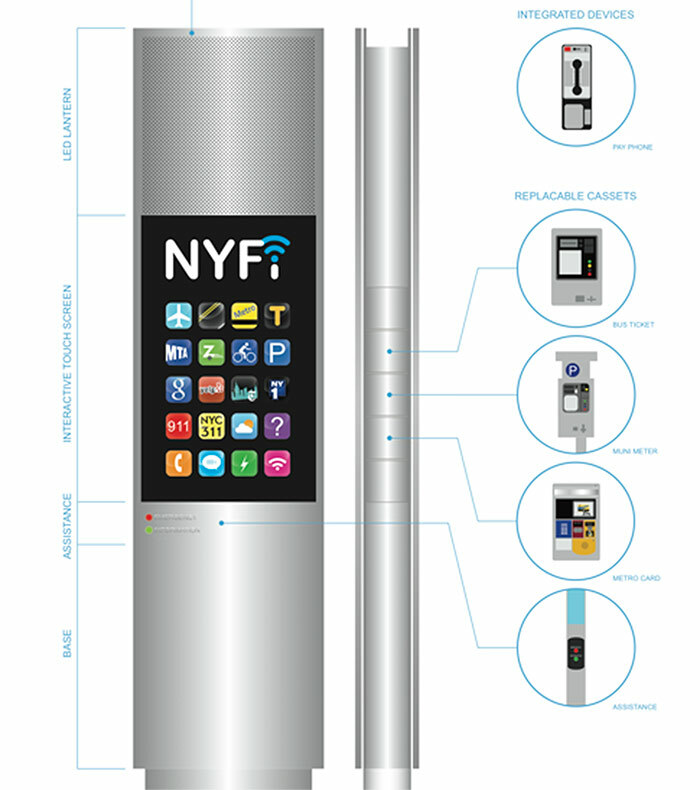 The most prominent feature of the Control Group and Titan’s NYC I/O: Responsive City design is that, besides providing passerby with community information on a daily basis, during emergencies the portal transforms into an information kiosk that will direct pedestrians to local shelters and provide important evacuation instructions. Additionally, the portals run on solar energy and are therefore supplied with constant power, a feature that will be particularly useful during emergencies. The second Community Impact prize was awarded to a group of students from NYU ITP, Cooper Union, and Parsons who designed the Windchimes. The minimalist three-panel design and push-button features slightly recall the classic form of the old payphones. A distributed environmental sensor network encourages a sustainable future for New York City. Lastly, the design for Smart Sidewalks by a team comprised of members from Syracuse University, UC Davis, Parsons, Rama Chorpash Design, and Cheng + Snyder, took home the award for Functionality. The slender hub, which is powered by solar panels, supports free WiFi connection, features a touch screen allowing access to weather information and historical photos and information on specific neighborhoods, and allows passers by to charge their cell phones. Using a color-code system, strips of LED lights spill onto the sidewalks and update pedestrians on local events according to their location. The sixth award, the Popular Choice Award, will be announced on March 15th, after the public submits their vote on their favorite design via the City of New York’s Facebook page.